POTENTIALLY transformational research on virtual fencing for sheep will begin this year in New South Wales. Deputy Prime Minister and Minister for Agriculture and Water Resources Barnaby Joyce last week announced a $299,314 grant to CSIRO to accelerate development of a ‘virtual fence’ system for weed control using sheep. 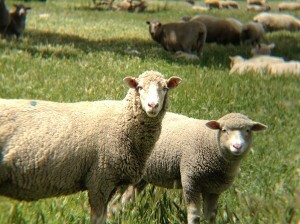 The research will initially trial collars that notify sheep they are approaching a GPS-plotted virtual fence with an audible warning followed by a mild shock if they ignore it and continue toward the fenceline. Principal CSIRO research scientist Dr David Henry said the research is potentially transformational because even though it will study the ability to control grazing sheep for the purpose of weed management, its value would be the same for grazing and pasture management for production or for stubble control. Dr Henry said virtual fencing for sheep might eventually involve miniaturisation of technology onto an ear tag, but the project would initially focus on using neck collars. Trials starting on New South Wales farms this year will hopefully determine if the technology can constrain sheep to a particular area or keep sheep out of an area and be able to manage weeds. Dr Henry said the big issues with using the collars on sheep are the effect on skin contact due to the wool and the technology’s “price point” or equipment cost. “What would the price point be for a bit of kit that a sheep farmer would be willing to pay for? “It has got to go to an ear tag in the future, but there is a fundamental question as to whether sheep will respond in the right way to the technology – whether it is an ear tag or collar,” he said. Mr Joyce said the project was part of the government’s $50 million investment over four years in the Agricultural Competitiveness White Paper, helping farmers and their communities to better manage established pest animals and weeds. “Grazing management is a proven tool for reducing the impact of common weeds on agricultural production and ecosystems. “However, it only works if farmers can target the right area in a paddock at the right time,” he said. “With this technology, the sheep wear collars which contain them in a ‘virtual fence’ area, which is set by the farmer. Federal Member for Parkes Mark Coulton welcomed the government’s action on pests and weeds. “Every year pest animals and weeds cost our farmers about $4 billion through control tools and lost production,” Mr Coulton said. “We want our farmers and land managers to be ahead of the game. “Improving and finding new ways to manage pest animals and weeds and ensuring people can access those tools as soon as possible is critical to driving greater returns through the farmgate,” he said. Sources: CSIRO, Minister for Agriculture and Water Resources. I am sure this is a revamp of trials done in Western Australia around 2000 where $2 million was wasted. Issues with battery life, battery changing and storm activity had cattle everywhere and the tag did not know what side of the imaginary fence it was on. If they are thinking it can be in an ear tag, I wish them luck.